The Kitty Hawk 18 was designed for a client who wanted a smaller version of the Bogue Sound 23. The hull shares the Carolina-style of the BS23, with a "broken" sheer and lots of flare forward that transitions to tumblehome back aft. The mid-sections are "S" shaped, as they are on the large Carolina Sportfisherman that are so popular these days. While it will be a challenge to build all these curves, the result will be a beautiful boat that will stand out in any harbor. 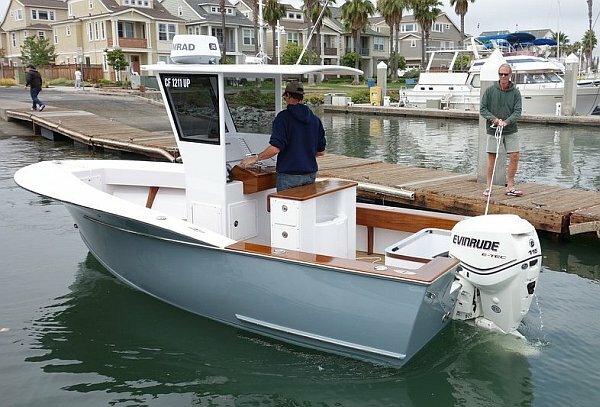 The Kitty Hawk 18 features an open cockpit that will easily accommodate a couple of anglers. An elevated casting platform forward features storage under. There is another under deck storage area in the sole just forward of the console. The console is simple and features a helm "bubble" where the wheel is mounted. The bubble can be built either from painted plywood or varnished teak or mahogany for the more traditional minded. The aft face of the console has a large flat area for flush mounting electronics. The top of the console is large enough to mount a compass. I envision a leaning post aft of the console, but seats or a flip-flop ice chest seat could also be used depending on the wishes of the builder. A cooler can be mounted forward of the console, but you will have to sit on it facing outboard as the casting platform precludes any leg room forward. Back aft there is a further storage hatch in the sole and a full height motor well. Her cockpit sole is self-bailing, but as in all small boats, I am sure water will come aboard if too many fisherman stand in the aft corners. I recommend the scuppers be drilled as close to the centerline as possible to minimize this problem. The hull design is a modified vee. The fine entry is over 48 degrees at station 1 and flattens to 12 degrees at the transom to promote efficient planing. For structural reasons and ease of construction, the chines do not have integral flats, but rely on external spray rails angled to throw the water and spray out and down. As mentioned earlier, her topsides flare in the traditional Carolina-style and there is quite a bit of tumblehome back aft. A quarter guard is mounted on the hull side aft to help protect the hull from docks and pilings. I would prefer it were a little higher on the hull side, but it lines up with the cockpit sole to ensure good structural support. 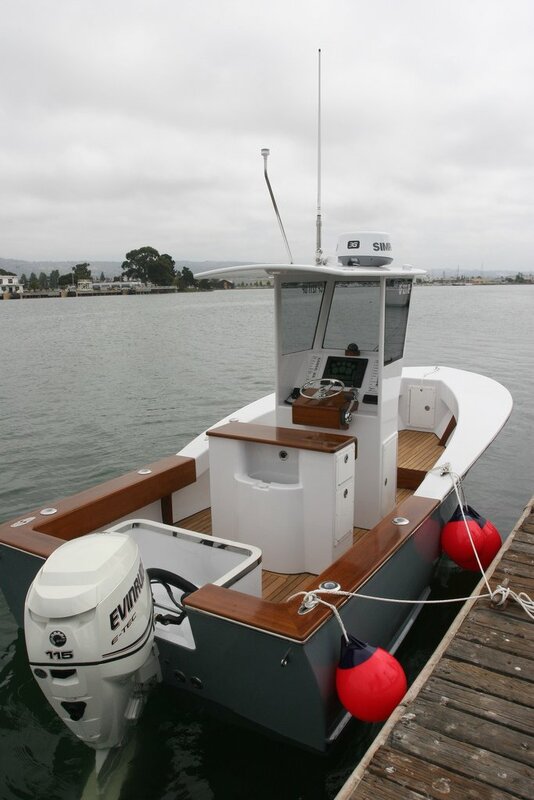 The Kitty Hawk 18 is cold-molded from two layers of 6mm Okoume Marine Plywood installed on the diagonal and covered with one layer of 1208 0/90 fiberglass set in epoxy. I have seen a few boats of this type that were built with very minimal framing, relying mostly on a couple of stringers in the bottom and a few small stringers in the topsides for all of their structure. I prefer a more conservative construction method and call for 18mm Okoume plywood frames every 36" to support those stringers. While these will impact the interior space somewhat, I believe they will insure the hull doesn't twist and flex in heavy seas. The keel, stem, topside stringers, chine logs and shear clamps are all made from Douglas Fir or Mahogany. An additional 3/4" "clamp" is added on top of the shear clamp after the hull is turned over to make sure there is sufficient wood to mount the sheer guard. The sole can either be Okoume Marine Plywood or treated plywood. Her transom is 3 layers of 18mm Okoume, for a thickness of 2 1/8". The Kitty Hawk 18 is available as both a Plan Set with full size frame patterns or as a CNC cut Frame Kit. The Plan Set includes 16 pages of drawings and 6 very large pages of patterns printed on plastic film to insure accuracy. The patterns were created from the CNC cut files and are a bit complex as they include all the cut-outs for the stringers, chines and clamp. Drawings include a strongback and a stem mold drawing for the laminated stem. The plans have also been converted to metric, for those of you outside the U.S. The Frame Kit is CNC cut and consists of all the framing, both permanent and temporary, the plywood stringers, transom and motorwell. Also included is a CNC cut building jig that forms the basis of the strongback and locates all the frames and the transom. 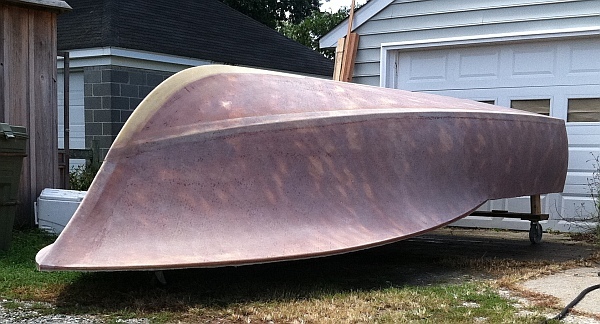 An additional Sole Kit is available that includes the cockpit sole, hatches and the hatch gutters. Even with all of the pre-cut pieces, the plan set is still very complete and includes 14 pages of drawings, including the Hull Lines, Hull Structure, Deck Structure and the Console to name a few. The Kitty Hawk 18 will be a challenging project for amateur builders, but a rewarding one in the end. Both the full size patterns and the pre-cut kit greatly simplify construction while eliminating the need to loft the hull. 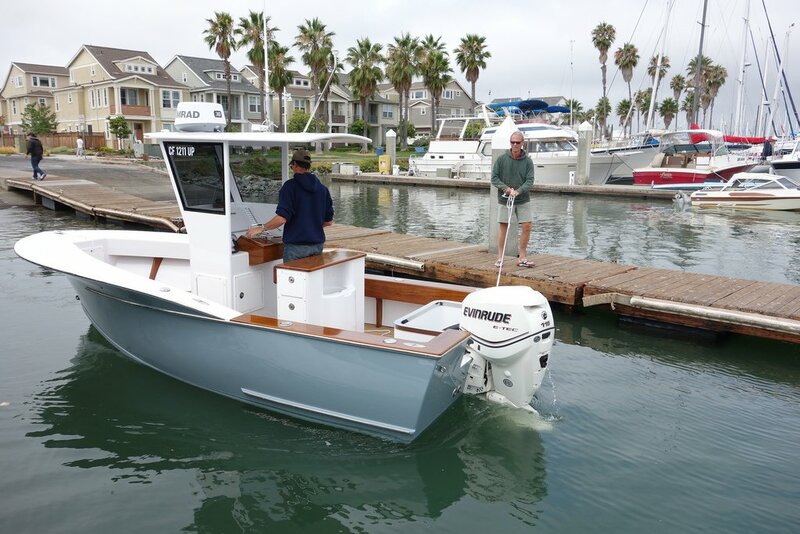 If you have been dreaming of a Carolina-Style sportfish, but don't have the cash to hire one of the famous Wanchese builders, maybe the Kitty Hawk 18 will hold you over! To see photos of the Kitty Hawk 18 under construction, please visit the Underway page. Study plans available below as downloadable PDF files. These can be opened with any PDF reader, most people already have the free Adobe Reader installed. Please remember that these plans are the property of Smith Marine Design and should not be used for any purpose without my written consent. Before placing an order, please read the Terms of Sale page. By placing an order, you are agreeing to the terms set forth. This page will open in a new window, just close the window when you are done. If you are in the Continental U.S. and would like to order the Plan Set, you can use the online ordering system below. The cost is $400.00 plus $30.00 shipping. If you are in Alaska, Hawaii, outside the U.S. or would like to pay by check or money order, please contact me. As costs for cutting the kits is constantly changing due to material and labor costs, I can not offer the kits at a fixed price. In 2013 the Frame Kit was in excess of $3,000 and the Sole Kit an additional $1,000. If you are interested in ordering a kit, please contact me and I will get you an up to date quote, including the shipping charges and any applicable taxes. 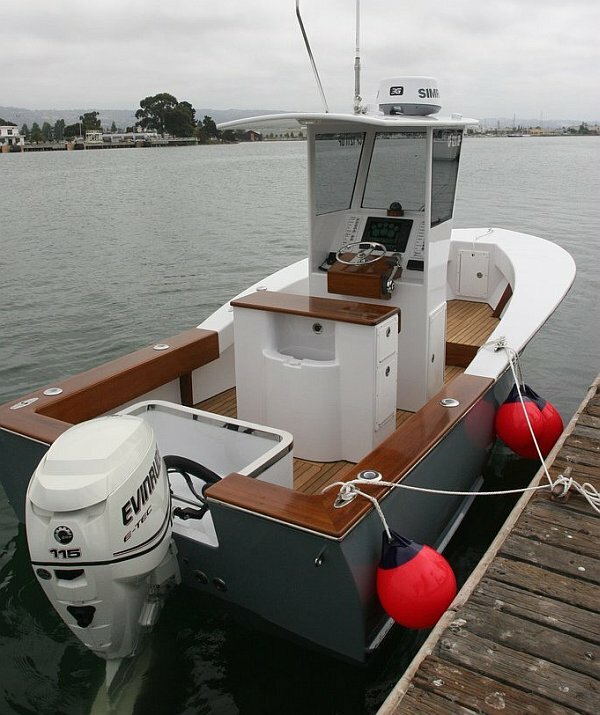 All materials on this site are the property of Smith Marine Design and any unauthorized use without prior written permission is strictly prohibited.